John writes to Christians in small communities under pressure of persecution and compromise, living within the all-encompassing culture of Roman imperial culture and claims of greatness. John saw vivid visions of evil, corruption, and powers of Death in the Serpent-dragon/Accuser, Wild beast, False prophet, Great Harlot. Not people but embodiments of Death, deception, violence, empire, wealth, etc. He saw the fall of the Harlot, Rome’s empire, now powerful. His final visions show him the outcome. The Harlot, one empire. The Beast, all empires. The Dragon, all forces of deception and Death. The last enemy Death itself. Opposite God’s Life. John’s visions lead us through cycles of 7 looking at the world in different ways, unfolding images of its deceptive appearance and deep, corrupt reality. Seeing the Gospel as Counter-Reality. We see a door to God’s throne, the slain Lamb. Seals reveal human destructive forces, earth’s response and what it means. Trumpets show the failure of a destructive vengeance and the pattern of following the Lamb. What does God want? His passion is to save his creation from destruction, to give life! The other side of that is to stop/destroy the destroyers of the earth. John sees this in the vision of the Serpent-Dragon/Satan, the Wild Beast, the Second Beast (false prophet). The dragon defeated from heaven, rages on earth. The Beast, forces of empire. The Second Beast deceives the world: Power, wealth, violence are the only reality. The mark. John has led us through a Vision of Jesus; Letters to 7 strong/weak, struggling, persecuted churches; Vision of door opening on God’s throne, creatures, elders, scroll, hero/slain lamb; Seals: human evils, earth’s response, cowering power, great multitude; Trumpets: failure of avenging, path of faithful witness, death, resurrection like Jesus, triumph of God’s kingdom. Now the most vivid vision runs through second half of Rev. Conflict between God, creator of physical world and life, and all forces of death, deception, “destroyers of the earth” (11:18). John is given visions to recount. We hear and see through his words. His visions stress Sevens: churches, seals, trumpets, visions of conflict, bowls. Are the 7s a sequence predictions– our past or our future? Deciphering a code. Neither would mean much in Ephesus, even today. 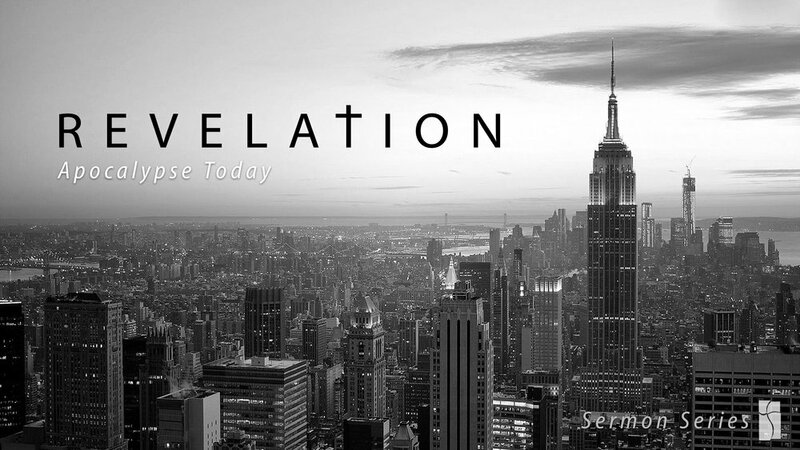 Revelation isn’t a divination book to foretell events. It is vision to see again things we know. The Seals & Trumpets suggest that the 7-visions are different ways of looking at the same great story. The Gospel is already there in the Throne vision in the Lion-hero who is a slain Lamb. The Seals & Trumpets build expectations, but the interludes redirect our understanding. One power of extended visions is to look at the drama of God’s story from different points ofview and to play out differing possibilities. The visions challenge what John’s readers want and expect – including us. They push us to see the Gospel’s distinct truth amidst conflict. John began with a vision of Jesus glorified (ch 1). Then Jesus’ letters to Seven Churches (ch 2-3). Amazing promise to struggling believers: “Those who conquer, I will grant them to sit with me on my throne, as I also conquered and sat with my Father on his throne.”(3:21) John is invited to begin to learn what this means. A door opens, Jesus invites, John steps through. A vision experience of God’s throne like Ezek 1 or Isa 6, but distinct. God is “One seated on the throne” described like gems, rainbow, lightning. Torches of fire – Spirits of God. Crystal Sea. Vision widens. Twenty-four elders: humans, gold crowns like high priest. 12+12, people of God. Four “living creatures” (animals), eyes all over: like Isaiah’s seraphs, 6 wings; like Ezekiel’s cherubim: lion, ox, human, eagle (later 4 Gospels.) Their worship identifies God’s nature.